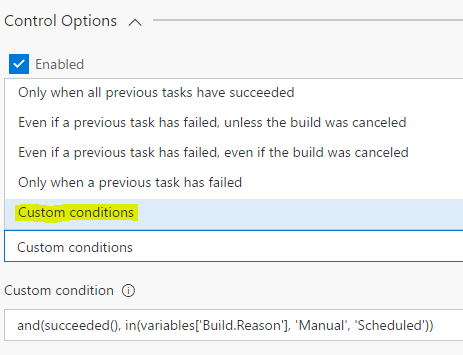 On March 29th, 2017 the VSTS team released a new feature that added the ability to specify conditions for running a build task. This provides more control over your build tasks, for things such as a task to clean things up (even if a build fails), or send a message when something goes wrong, under conditions such as certain branches or with certain triggers. Custom Conditions appear in the new build definition editor under Control Options. Custom conditions are not currently available for Task Groups because they still use the old build definition editor (this is on the backlog). I had another build definition that would run CI, along with packaging and pushing packages to our artifact repository. By setting the build conditions I could combine the two definitions and only run the extra steps to package and push if the build was manually queued or scheduled as part of our nightly build. Note: I encountered a bug where conditions do not save the first time. Reload the build definition editor, re-enter the conditions and they should save the second time around. Have you used custom conditions? Leave a comment below! I have list of build definitions and each has different Build Number Format(Total 3 types of build format). So I want to set a release definitions, but it will check correct build number format then only start deployment in VSTS. Can anyone help me ?